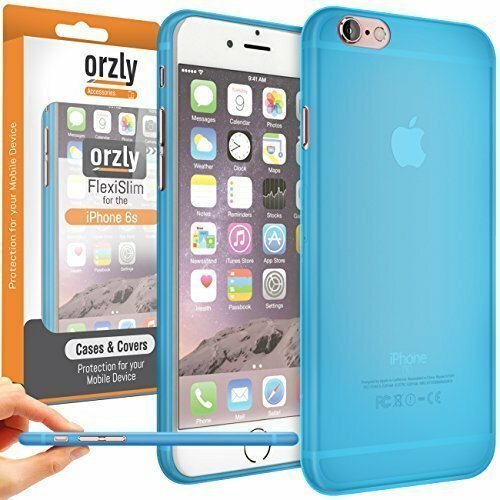 Orzly速 - FlexiSlim Case for Apple iPhone 6 & 6S (2014 Version & 2015 Versions of 4.7 Inch Model) - Super Slim (0.35mm) Protective Phone Cover in Semi Transparent BLUE@1106 Rs [Mrp:-1106] - Onlinedeals.discount - A leading product discovery website. Find the true prices of products, read reviews and buy top brand products at reasonable prices. The Orzly FlexiSlim Case is ideal for those who hate using cases because of the bulk it adds to their slim & sleek devices, but still worry about surface damage to their shiny new phone! This case has a semi-translucent finish which ensures that the design and branding of your phone remains visible through the case. With the Orzly FlexiSlim, you no longer have to feel like you’re making compromises about hiding your phone away inside a case or adding on bulk just to keep it looking as new as possible. *** PLEASE NOTE *** This case is NOT designed for impact against falls, drops, bumps or any significant contact with other surfaces. This is an extremely THIN case designed to simply prevent scratches and surface damage. If you are looking for a more protective case, please look at other cases from the Orzly range for more suitable options.